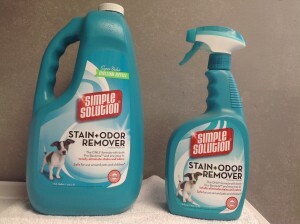 Permanently removes pet stains and odors. Works through a unique beneficial bacterial enzyme formulation that speeds up the natural biodegradation process. It’s more than just a cover up. It actually eliminates stains and odors at their source. In addition to removing stains & odors caused by urine, vomit, feces, blood, mildew and other organic sources Simple Solution will also remove many other spots & stains such as dirt, grass, coffee, tea, red wine and juice. Safe to Use- Safe to use on color-fast carpets, upholstery, drapery, clothing, pet bedding and other water safe surfaces. Works on old and new stains. Safe around children & pets. 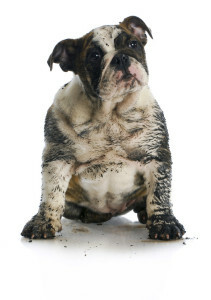 How many times have you heard this one: What can I do to keep my dog from urinating in the same spot? How do I keep them off the couch? Pets find the subtle odor of this repellent very unpleasant. When your home smells a little like Fideo, Simple Solution Carpet & Room Deodorizer will do the trick. The fresh long lasting fragrance is 10 times more effective than competing products. You can pick up your products at our office, or for our maid service customers; you can call your order in to our office and we will deliver them to your home at no additional charge on the day of your cleaning.